The critique "Refrain from making reckless remarks undermining the DPRK-China relations," published by the Korean Central News Agency (KCNA) last Wednesday, lashed out at China and Chinese media and thus garnered worldwide attention. How should we interpret the critique of KCNA? What should China's response be to the uncertain situation? The Global Times collects four opinion articles over the issue. The KCNA commentary issued a strong warning to China that North Korea "has already become one of the most powerful nuclear weapons state … China should no longer try to test the limits of the DPRK's patience" and "had better ponder over the grave consequences of its reckless act in chopping down the pillar of the DPRK-China relations." China must be highly vigilant toward such remarks. Once the Sino-North Korean relationship collapses and war breaks out, the possibility for it to launch strikes against China with nuclear and chemical missiles cannot be excluded. It is estimated that North Korea has enough materials to make 10 nuclear warheads. This is more than 20 times the power of the Hiroshima blast, and is posing a catastrophic threat to regional security, especially to Northeast China. It is also believed to have the world's third-largest stockpile of chemical weapons, with the nerve, choking and other toxic agents between 2,500 and 5,000 metric tons, which can be launched by mortars, rockets and missiles. While most of China's anti-missile systems are deployed to protect major strategic targets, many second- and third-tier cities are exposed to the threat of North Korean nuclear and chemical weapons. In the meantime, Beijing must also be on guard over possible nuclear leaks after potential US strikes against North Korea's nuclear facilities. Two of the nation's missile launch sites, Musudan-ri and Dongchang-ni are respectively only 65 and 80 kilometers away from the Chinese border. The nuclear reactor at Yongbyon is only about 100 kilometers from Northeast China. Once the reactor is destroyed while functioning, an area between 400 and 1,400 kilometers could be exposed to radiation. Northeast China will face catastrophic consequences. The KCNA editorial publicly criticized China's official media - People's Daily and Global Times, accusing them of running articles that constituted "a wanton violation of the independent and legitimate rights, dignity and supreme interests" of North Korea. China is one of the few friends North Korea has in the world. The international community, including the US, believes that China can have a special influence on North Korea and the main reason that the North Korean nuclear issue has yet been resolved is that China's pressure on North Korea is not enough. However, China's influence on North Korea is not as great and effective as expected. What surprises the world is that North Korea has repeatedly ignored China's call on the denuclearization of the Korean Peninsula even if it faces severe external pressure. Huang Xiangmo, founder of the Australia-China Relations Institute at the University of Technology Sydney, believes that North Korea's confidence on taking a hard line in the international community is mainly due to its economic progress, which is reflected not only in the steady growth of its economy, but also its decreasing dependence on the outside world. Huang pointed out that given the special relationship between China and North Korea, the Chinese government may have a better understanding of the real situation in North Korea than the US. Therefore, China's views on North Korea are more rational and realistic than those of the US. 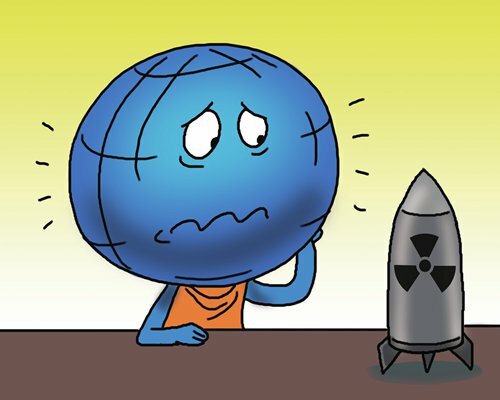 Not long ago, Fu Ying, chairperson of the Foreign Affairs Committee of the National People's Congress, published an essay on the US Brookings Institution website, in which she observes that North Korea is stepping out of economic difficulties and how this will influence the North Korean nuclear crisis. Fu's observations deserve attention. What is ignored by the world is that the North Korean economy has witnessed positive growth for consecutive years under Kim Jong-un. According to the analysis of South Korean institutions, the North Korean economy has achieved an average annual growth rate of around 1 percent in the public sector. If the non-public sector of its economy were to be included, the actual annual growth rate of the North Korean economy may be more than 5 percent. This rate of development in North Korea's economy is closely related to Kim's reforms. In the past five years, Kim has expanded the autonomy of enterprises, developed the service industry, increased the number of special economic zones, gave preferential treatment to foreign investment, and increased the export of labor. This series of actions have been playing a slow but crucial role in North Korea's economic recovery. The game on the Korean Peninsula over the past five years shows that the US and China should not underestimate Kim Jong-un. Trump's administration said past diplomatic efforts have failed to halt North Korea's unlawful weapons programs and nuclear and ballistic missile tests, and the era of strategic patience is over. Instead of showing weakness, North Korea displayed its toughness through fierce words and various actions. In public opinion, North Korea, the US and its ally South Korea, seem ready for war. Tensions in the Korean Peninsula are rising, but war will not break out soon. There would be no winners in armed conflicts and all parties involved would suffer. History has proven that war cannot solve problems. Just like Chinese Foreign Minister Wang Yi said, "we can't risk even a 1 percent possibility of war; the Korean Peninsula is not the Middle-East. If a war breaks out, there would be unimaginable consequences." Dialogues and negotiation is the only key to open the door for resolving the North Korean nuclear issue. All parties must carefully consider the suspension-for-suspension solution proposed by China, which suggests that North Korea suspend nuclear and missile activities if the US and South Korea halt military drills to defuse the looming crisis. A joint statement by the US secretary of state, secretary of defense and the director of national intelligence on April 26 reiterated that the US will increase pressure on North Korea, while it seeks stability and peaceful denuclearization on the Korean Peninsula and the US remains open to negotiations toward that goal. It's hoped that both North Korea and the US could release positive signals and alleviate fears of armed conflicts on the Korean Peninsula. The Korean Peninsula now is witnessing boiling tensions. Though North Korea's irrational behavior is ultimately aiming to attract the US' attention, the US' North Korea policy stems from its strategic calculations. The US, on the one hand, aims to continue provoking the North Korea to develop its nuclear program so that its allies, Japan and South Korea, will have to further tilt toward the US. On the other, it exerts great pressure on China to solve the North Korean nuclear crisis. Once North Korea turns against China and is pushed toward the US, the US would gain some leverage over China. For Japan, a war on the Korean Peninsula is a desired development since it can realize military rise from a war on the peninsula. Russia doesn't want war, but hopes the crisis can last longer. In that case, the US would be occupied with the nuclear issue and would not exert more pressure on Russia regarding Ukraine and Syria. Russia is then able to take the opportunity to suppress Ukraine while protecting the Syrian government, and spare no effort to boost the economy and develop its military forces. However, South Korea would be provoked to deploy the THAAD system once and for all. China resolutely opposes the war on the Korean Peninsula, for it is devoted to the Belt and Road initiative and economic development, which requires a peaceful and lasting exterior environment.